This post is a continuation of my kayaking to see the airport roost. 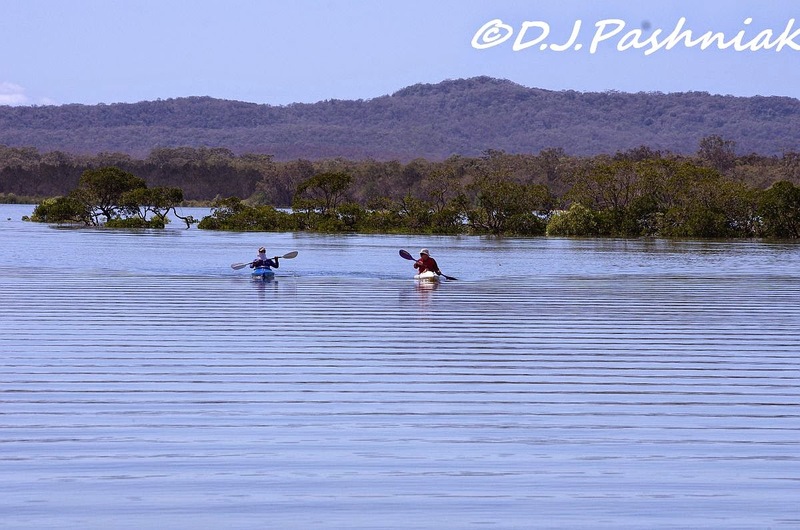 After I counted and photographed the birds out there I decided to head back inland and kayak around Mullens Creek. Because there was almost no wind I knew I could just sit back and enjoy myself. I am including an image from Google Earth to try to show a little more clearly what this area is like. The image is quite accurate except that the areas of sand (brown areas) have been filled in with mangrove trees. They have grown up a lot since this image was taken. Remember too that all those sand areas fill up with water on high tide - which of course this was when I was kayaking around there. I have marked my route in yellow and it is about 1 1/2 kms. 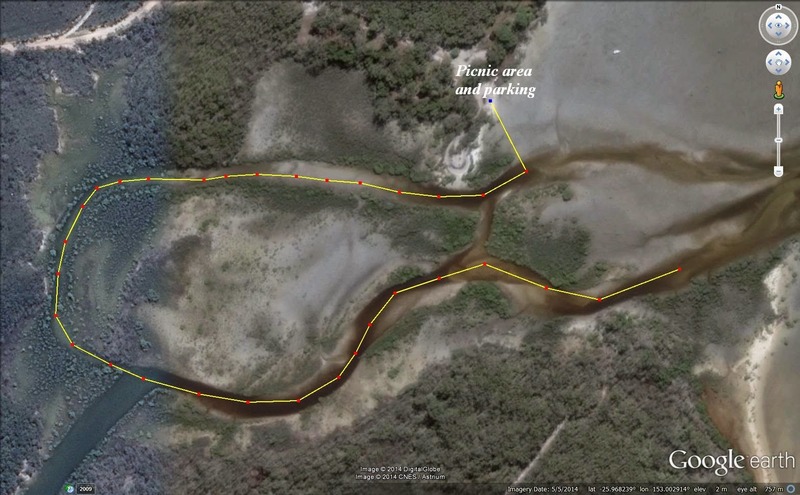 I paddled down the south side first then where the creek splits I took the northern channel and then around to the parking area. 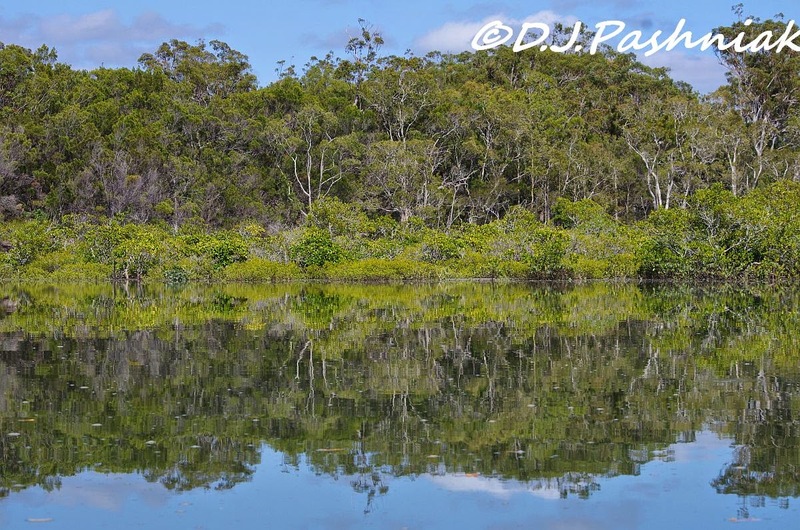 Down on the creek between the mangrove trees and shrubs it was very still. 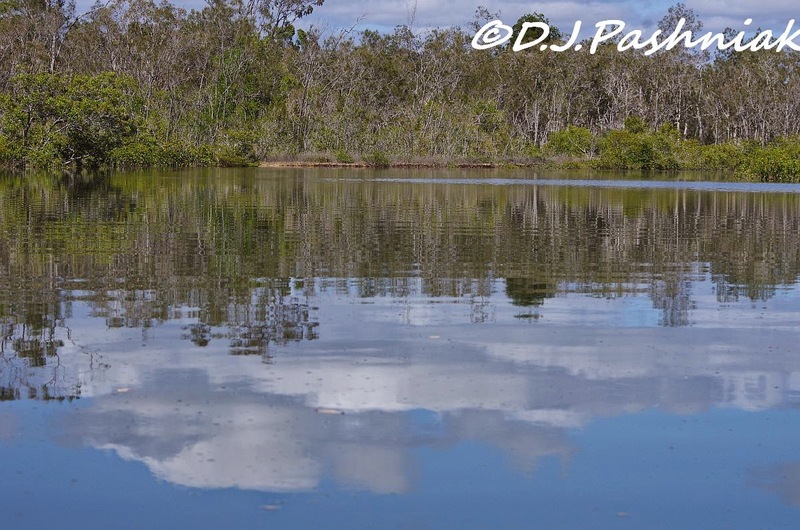 Much of the time I was paddling over clouds reflected in the still water. When I moved closer to the banks then I was moving over the reflections of the bushes. 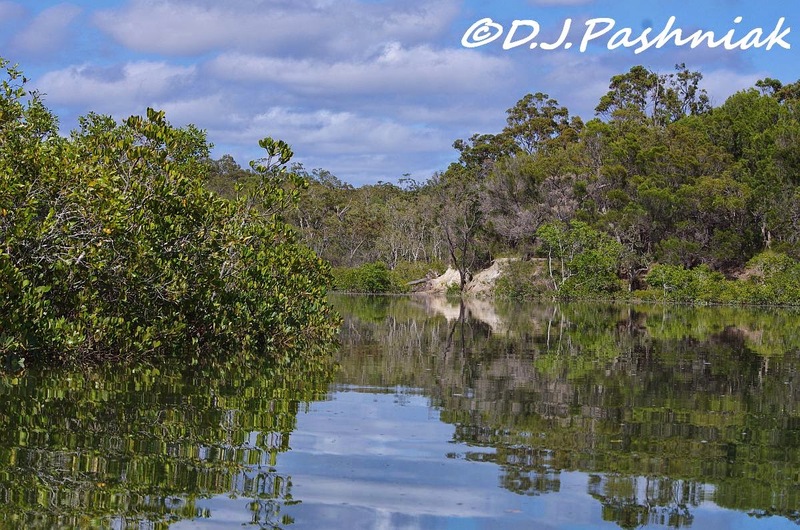 The mangroves are bright green in these photos. 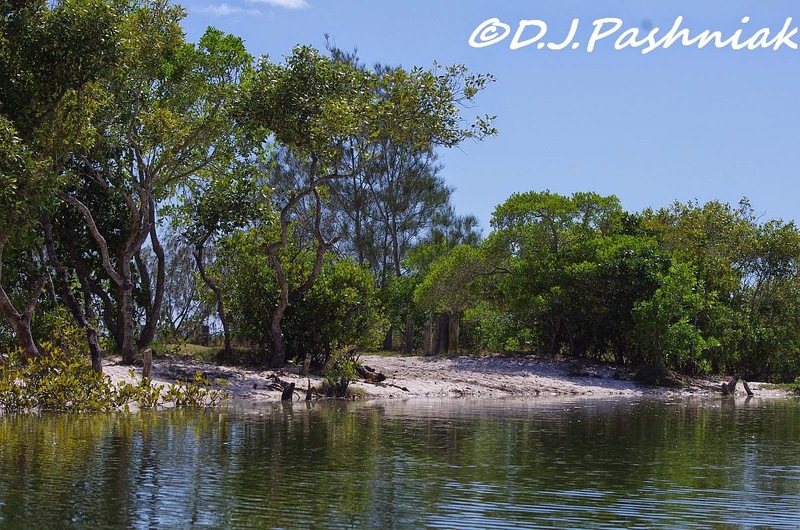 There are five or six different kinds of mangroves in this area and all of them must have salt water for part of the time to put their roots and trunks into. Some of the trees are out of the water for some time when the monthly and seasonal tides are lower but at times of good high tides they almost look as if they are floating on the surface of the water. It is so peaceful here - no traffic noise or noise from houses at all. 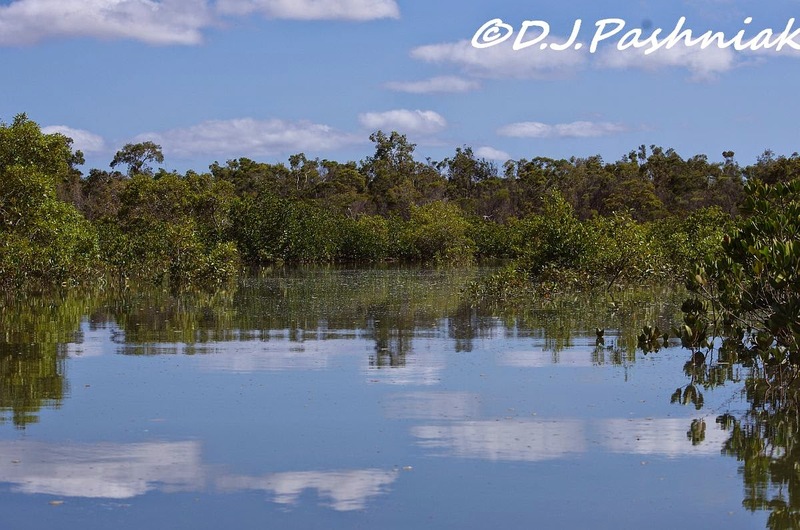 Occasionally I heard birds - mostly Mangrove Honeyeaters - but they didn't show themselves. 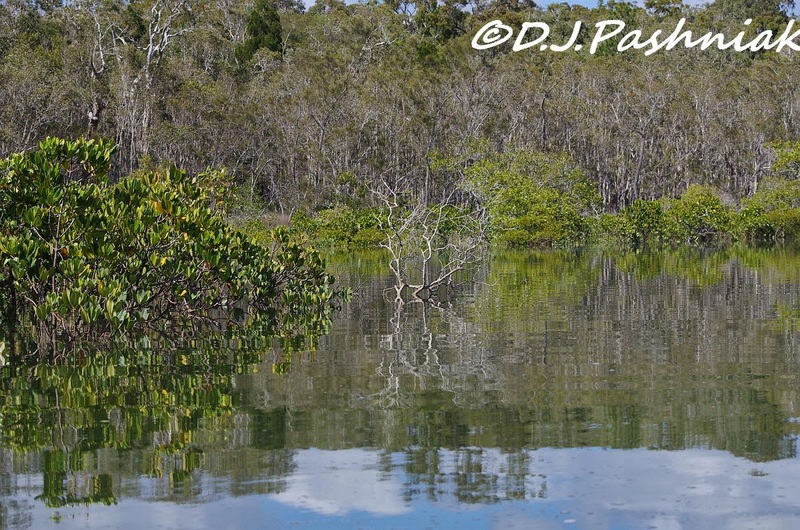 The entrance to the north channel of the creek is left of center and well hidden between mangroves. 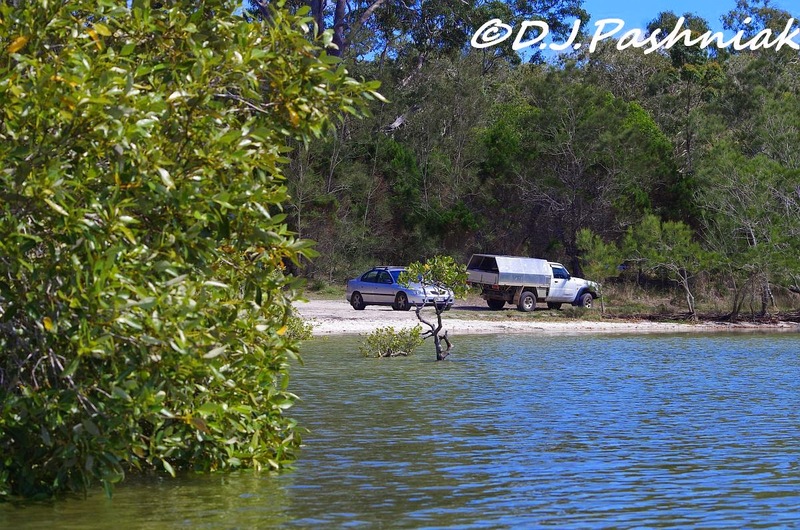 This is the only boat launch available for boats needing deeper water in which to launch. Just around the corner is the picnic and parking area. As I finished tying the kayak on top of the car another couple of kayaks also came in. They had paddled further south to another creek. I really wasn't looking for birds on this part of my kayaking but if they are right in front of you then they must be photographed! 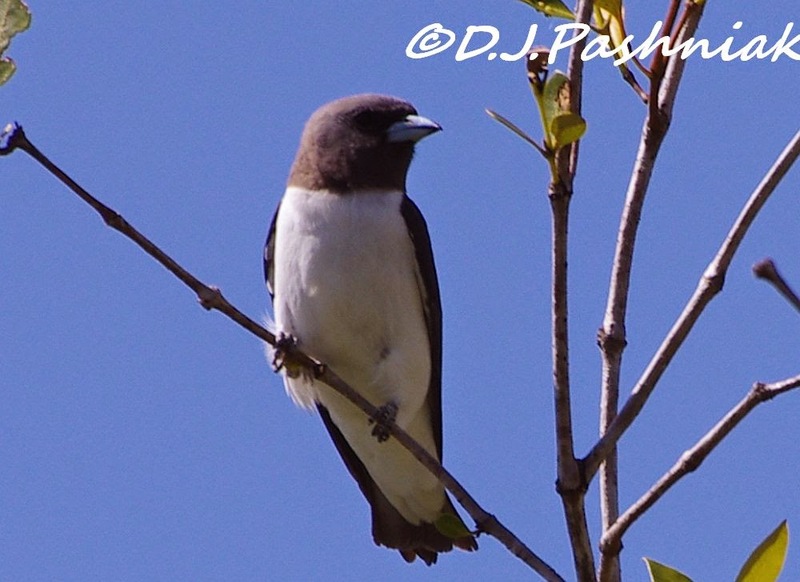 I had seen a number of White-breasted Woodswallows swooping over the water so there must have been insects for them to catch. The way they swoop and glide reminds me of the paper gliders we used to make from our school papers many years ago! This Magpie was walking around my car when I got back to the parking place. It was looking intently up to the windows which made me think that it might have been fed by people from their cars recently. When I got home I found a a not so welcome visitor down in my back yard. 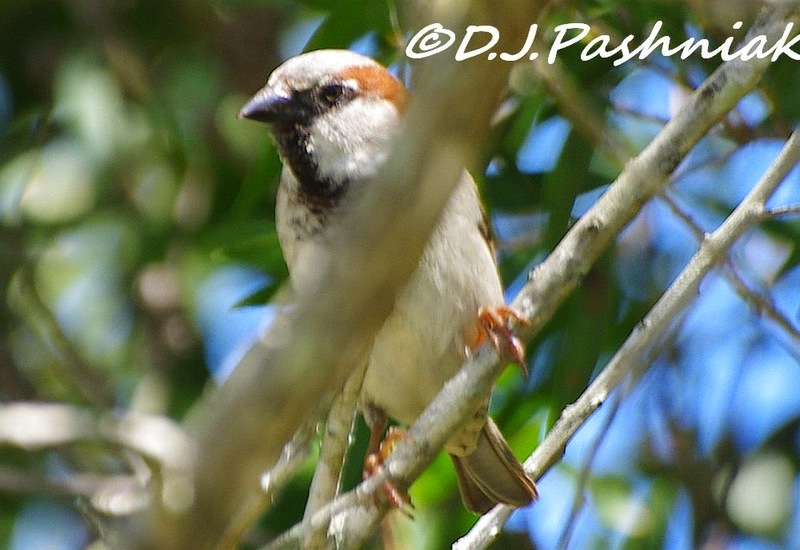 I thought I had been hearing Sparrows for some days but this was the first one that let me get close for a good look. Sparrows of course are NOT native and they have a nasty habit of taking over from other native species. beautiful reflections! really peaceful feel! love the swallows. You make me wish I had teh kayak still. It is so nice to be in one. Great tour. Oh, yes! The reflections are so beautiful, Mick!! Always love the swallows! Really wonderful captures for the day!! Thanks for sharing the beauty!! Have a great week!! It's good to see an aerial view of your birding spot on the creek. It must be quite peaceful once you're away from the parking spot, but I'm sure two vehicles is ;less than the norm. Those Wood Swallows are so unusual with waht look like finch bills and feeding habits I guess of a swallow. Yes, the magpie has been there before, I agree. Sorry about the House Sparrows but if they are like our own the species isn't doing too well at the moment. I was also going to comment on the reflections on the water. So peaceful and beautiful. We have the same sparrows here in the US, brought to us on British ships. We will hope that it is that good on Friday when we come down to kayak. Beautiful photos hope the Sparrows don't hang around to long. The scenery is beautiful there, a lovely place for kayaking.. Love the birds, especially the Woodswallow.. We have tons of the House Sparrow here.. Great photos and post.. Have a happy week! 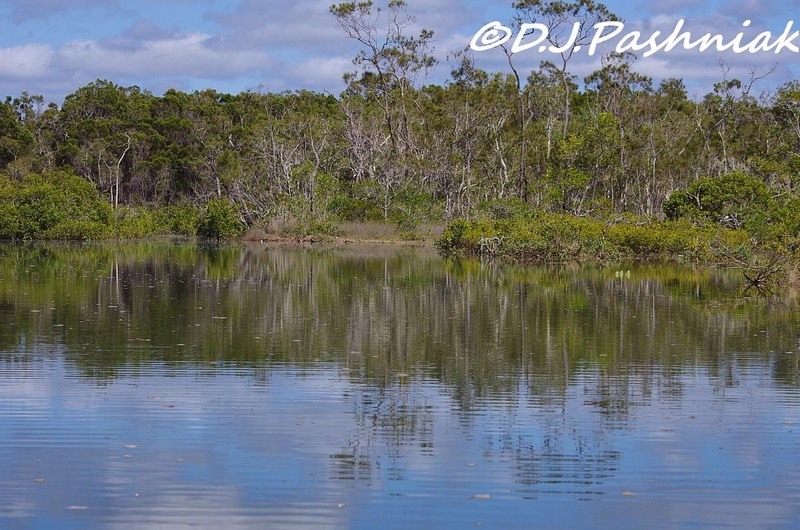 This is a great place to get on the water with beautiful scenery and fantastic reflections. 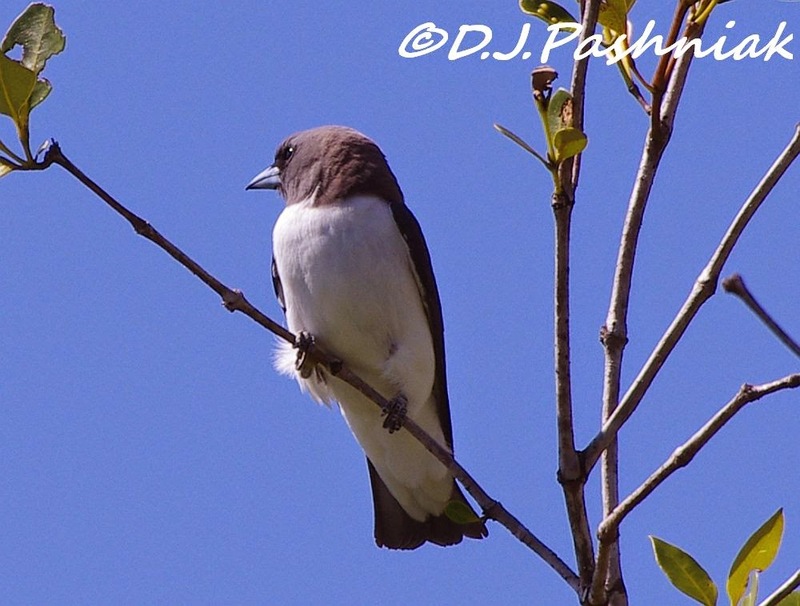 Love the White - breasted Woodswallows. A fantastic set of pictures and some great birds. The Magpie looks great. Beautiful scenery with lovely reflections. 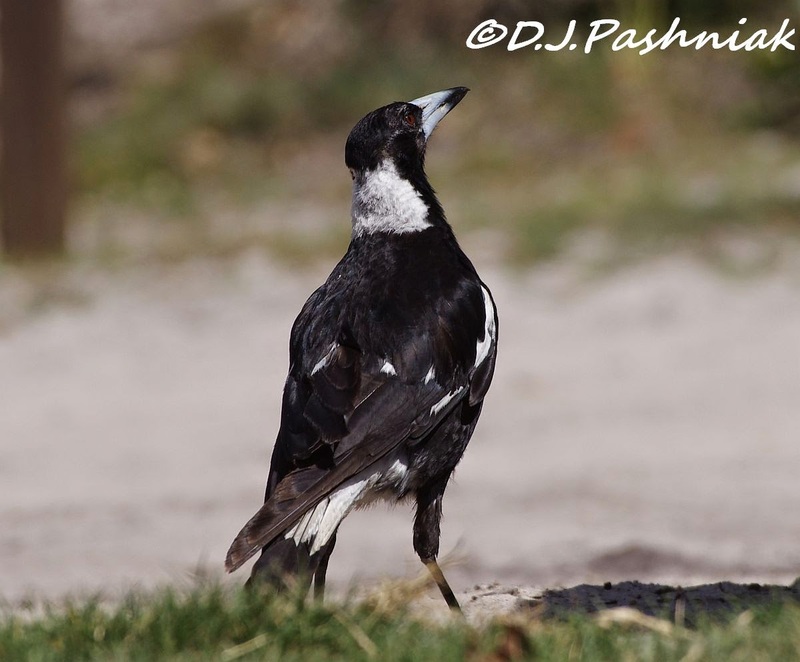 The magpie is a handsome bird. Stunning, great with the satellite photo to get an idea of the area. Very scenic location with such beautiful places. Yes, that is the PERFECT place to kayak and canoe! Very controlled area, with dense vegetation. You got some great bird shots. dreamy landscape and what a way to enjoy it..... cheers for the map image, gives a good appreciation of your travel on this days adventure. Those are the prettiest swallows I've ever seen and the best pictures ever! Didn't realize sparrows were invasive and must read more aboit that here. We have several types in our "yard" here. Nice pictures - it does look a very birdy place. 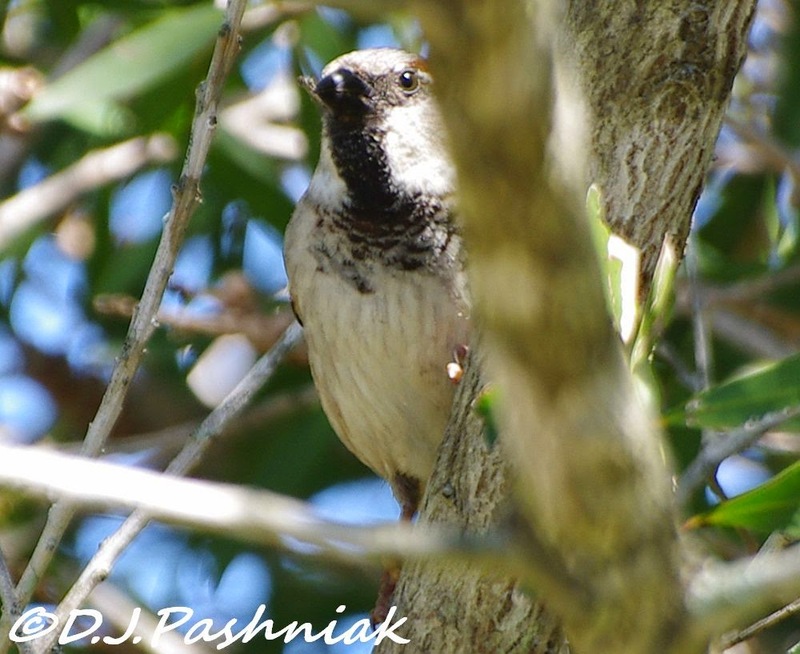 House Sparrows are doing well in most parts of the world except the area that they are native to! The same as Rock Pigeons....and several other species now that I think about it. What a wonderful route you take.